When someone tells me that they can’t believe I’m 51 or guess my age to be younger than I am, it makes me feel good. Real good! I think most people, especially women, want to defy age. “I want to look my age (or older)”, said no one, ever! I do invest a lot of time and money in looking younger and looking my best. Yet, short of having plastic surgery or injections, I haven’t found anything that will take care of the deeper wrinkles and lines on my face nor the crow’s feet. I admit that I didn’t take care of my skin like I should have when I was younger, but I truly believe that it is never too late to start. I was presented the opportunity to try RoC® RETINOL CORREXION® Deep Wrinkle Night Cream and take the RoC Retinol resolution… and being someone always up for a challenge (especially when the end results may be fewer or no wrinkles), how could I say no? So, I’ll be spending the next four weeks using RoC® RETINOL CORREXION® Deep Wrinkle Night Cream. What is the RoC® RETINOL RESOLUTION? If you are a woman like me who wants to look younger and you want to get a head start on your most beautiful self for the coming holidays and for 2016, RoC Skincare has invited you to take the RoC® RETINOL RESOLUTION. Want to join me in the RoC® RETINOL RESOLUTION? By using clinically proven RoC® RETINOL CORREXION® Deep Wrinkle Night Cream to visibly smooth wrinkles in just 4 weeks we will be wowing our family and friends when they see how we’ve turned back time. An essential part of a skincare regimen to help collagen-depleted skin, Retinol is the #1 dermatologist-recommended cosmetic anti-aging ingredient to help improve the appearance of fine lines and deep wrinkles. Yes, that’s what I said, “deep wrinkles”. But… not all RETINOLS are created equal as there are differences in ingredients, manufacturing and even packaging that can impact its ability to help you age beautifully. This is good to know! We all have our own natural renewal system and RoC RETINOL works in tandem with it to reduce the appearance of fine lines and deep wrinkles and improve our skin’s overall tone and firmness. Did you know that if not packaged properly, RETINOL can degrade? RoC® RETINOL products are packaged in a special aluminum tube that protects the RETINOL from light and air. This keeps it stable, giving you the best results, always. RoC® RETINOL CORREXION® Deep Wrinkle Night Cream contains more than Retinol but an exclusive combination of pure retinol and an essential mineral complex that is clinically shown to visibly reduce even deep wrinkles. There are those words again, “deep wrinkles”… I don’t know about you, but the thought that something I can buy from Walmart will reduce even deep wrinkles makes me very happy. When you apply the cream nightly, the upper layers of your skin appear firmer, leading to a visible reduction in fine lines and wrinkles. And after 12 weeks’ use, even deep wrinkles are visibly diminished. RoC® RETINOL is up to 2x stronger than imitators based on vitro Retinol activity in RoC Retinol Correxion Deep Wrinkle Night Cream. Overnight your skin works to repair itself, so it’s important to have a good bedtime facial routine. RoC® RETINOL CORREXION® Deep Wrinkle Night Cream is clinically proven and contains a mix of pure retinol and an essential mineral complex, which is designed to work through the night to help reduce the appearance of deep wrinkles. RoC Retinol skin care products, including RoC® RETINOL CORREXION® Deep Wrinkle Night Cream, can be purchased at Walmart. I’m excited to get started! 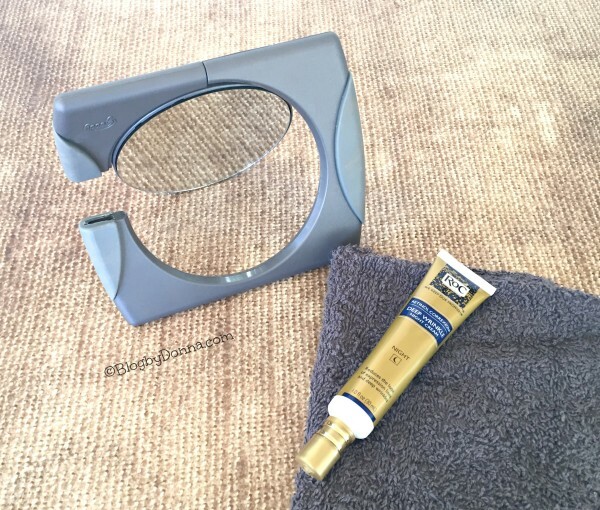 Be sure to check back in a month to see what I thought of the RoC® RETINOL CORREXION® Deep Wrinkle Night Cream and my results in the RoC® RETINOL RESOLUTION. So ladies, will you join me in the #RoCRetinolResolution? Visit http://www.rocretinolresolution.com to make your pledge and enter into a one-of-a-kind sweepstakes through November 30th. I have been considering using this. I have some little lines that I want to GO AWAY. I definitely am down to look younger. I need to take the Retinol Resolution. I’m always interested in getting rid of wrinkles. I have several, and I want them to go bye bye. This could probably help me a lot. I do worry that my lines will just get more pronounced as I age. I love ROC products. They are very good and well recommended. This stuff sounds absolutely amazing! I hope you do a before and after to see if we can see visible results!! Thanks for sharing! Im excited for you!! I HAVE USED THIS A COUPLE OF YEARS AGO IT WAS A GREAT PRODUCT. BUT IT STARTED DRYING MY FACE OUT SO JUST MAKE SURE YOU USE A SPF. I am in my early thirties but feel prevention is key. If there is a way to stop those first signs of fine lines from getting any more visible, I am all about it. I have a tube of this and haven’t tried it yet. I need to though it sounds like! This sounds like an amazing product to use and thank you for your review. I have heard really great things about Roc. I would definitely like to try it for myself just to see how it would do on the fine lines that are starting to pop up on my face. Really there is nothing more impactful than taking care of one’s skin. This is a great and easy solution, saving $$ going to a doctor for prescriptive care! Roc products were recommended to me by an older lady at my job. She looked great and had a very youthful spirit. I will take her advice. Each year there are just a few more signs that I’m not as young as I used to be. It’s good to know what can help slow those signs a tad. ROC productss are great. They help for skin issues a lot. I was just looking at some ROC products today. I turned 40 over the summer and while most can’t believe my age, I know I can see it. Have not heard of this before but as I am over “that hill” it is a product that I could use. Will have to add it to the shopping list for next time I am out and about. I can’t wait to see your results! I’ve heard great things abut RoC! Can’t wait until you share your results! My Mom uses it and loves it. I have some of this in my linen closet with some other samples. Sounds like I need to give it a try! I’ve never used ROC products but this sounds like a great idea. I would love to give it a try. Wow, retinol sounds pretty awesome! I’ve never used it before, but it looks like something I need to find out more about. I’m into preventative measures right now. Luckily my skin is being kind and holding off on the wrinkles for now. I USED THIS A COUPLE OF YEARS AGO MAKE SURE YOU USE A SPF. BECAUSE YOUR SKIN IS GOING TO FEEL DRY. I tried this a couple years back too and remember it being pretty good. I even bought my mom some to try. I should look into this and try it. I’m a few years older than you and I’ve really noticed time is starting to show. Thanks! I definitely have some lines I am starting to worry about! I can’t wait to give it a try!